So school has been in session for over two months and my obligations have increased. 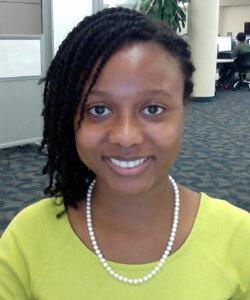 I needed to find a hairstyle that would last for about three to four weeks because I continuously found myself exhausted after a day of exercise, working, going to class, studying and fellowship. I was pooped to say the least and needed a cute style that had versatility and longevity. 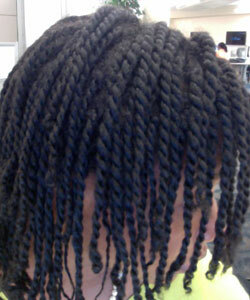 I am seeing an increase of naturals rocking natural two-strand twists, and I was very hesitant at first. Every time I would envision them on myself, I had a flashback of third grade picture day photos with barrettes in my hair (#notswagat21). It was not until I started working at a salon that I realized how versatile they are. Styles can range from wearing a ponytail, French braid or a cute pin-up style. 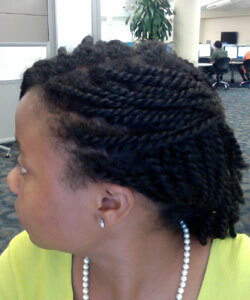 The process took me four hours just to do the twists, but for a style that can last a month, I can't complain. 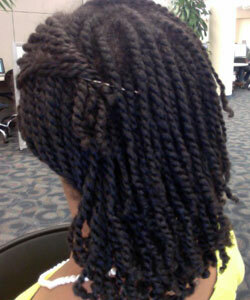 Here are my steps to getting long lasting two-strand twist. Since you will be twisting on blown out hair, you want to assure that all product build up and dirt are cleansed from the hair. Using any heat appliances on dirty hair is not good for your hair or your tools. In order to decrease the potential of heat damage, you want to give your hair a good moisture treatment, especially if you plan to keep them in for a while like myself. Grapeseed oil and coconut oil work well as heat protectants. Everyone’s hair has a different sensitivity to heat, so using a protectant is not really guarantee against heat damage if you set heat appliances at their highest heat settings. So, always keep your blow dryer on low settings to prevent irreversible damage. The smaller you section prior to the blow out, the better your results will be, but do not take that to the extreme. You can actually protect your hair by making moderately sized sections, so that you do not make sections so small that you fry your hair due to over-concentration on a small area. Doing a blow out is helpful for three main reasons: stretch, less frizz and versatility. 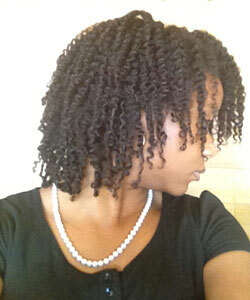 When you blow your hair out prior to twisting you avoid the potential of your twist coiling without uniformity. Because your twist will be stretched this also adds versatility. Hair that is styled wet is bound to become frizzy faster simply because the curls are not lengthened. As long as you put your twist in a satin bonnet at night your hair should keep the integrity of the twist by the morning. You want to make sure you use a blow dryer with a comb attachment. This allows you to prevent your hair from flying around as you blow dry. It is also essential to comb downward to ensure that the hair shaft is being sealed shut. When hair is being disheveled you can agitate the hair shaft and cause damage. Sectioning your hair prior to twisting will help to keep loose hair from getting entangled while you twist. Without good sectioning, grabbing loose strands can lead to accidental breakage. I twisted with Earth’s Nectar Sculpting Butter (love it!) because it is an oil-based product. Most natural hair products are water based, but using them only encourages you hair to revert while you are twisting and can shorten the life of the style. So far I have worn a low ponytail and a French braid. I have 28 more days to be creative! How do you style your two strand twists?